Aleksandra and Wendy work with the L’Arche Community. Recently they spent a month in Bangladesh. Among other experiences, they discovered the club at the station run by the Taizé brothers living in Bangladesh. In one of the poorest neighbourhoods of Mymensingh, near the little slum close to the railway station, there is a club attended by very poor children. The name of the club is “We are all kings and queens!” Three afternoons a week many activities take place in this club; some fifty children between the ages of 6 and 15 like to gather there. The children who are 12 years old or above have their own meeting, and join the rest of the group at the end of the afternoon. After a time, when they have all been singing together, the children sit and listen to some of those who share what they have been doing during the past 24 hours. It is quite fascinating to hear them speaking with such simplicity of their daily life, sharing events which shows how often they have to face violent situations or all kinds of dangers. It is not only the danger of being robbed of the little money they make from their work (like collecting old papers in the streets) or from stealing (we try to teach the children not to steal, but we are not always successful). The danger of prostitution for the elder children is quite real. Another danger for children and young people living most of the time in the streets is drug addiction. For the last 3 or 4 years glue sniffing has been spreading rapidly in Bangladesh. Once a month, all the children come and spend a whole morning at the “Taizé House”. 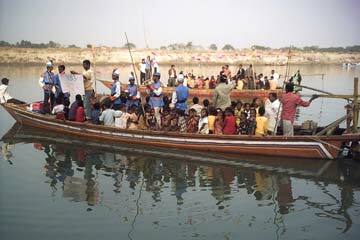 It is a time when games are organized in the big open space near the River Brahmapoutra. The morning activities always end with lunch with the college students who live at the Taizé House. Sometimes, on special occasions liked Christmas, one or two boats normally used for bringing people across the river are hired and everyone enjoys a beautiful trip on the river. Four times a year there is a three-day “children’s camp”. It is a wonderful time for these children who often have never had the opportunity of spending a whole day without having to work and bring home money. The children’s camp takes place in villages located about two - three hours by bus from the city of Mymensingh, where we know some families ready to welcome the children. Usually the group is made of about 30-35 children, accompanied by one of the Taizé brothers and some young helpers. Most of the time is spent in playing together, drawing pictures, singing together, or sharing one another’s life stories. Meals (three times a day!) are also a very important time for everyone! Every day about two hours of “community work” is planned, in order to help with something in the village: planting some trees, or helping in various activities. The children who come to the club are so full of life and joy! When you meet them for the first time you can hardly believe that they often experience very painful situations in their daily lives that are marked by such great poverty! Most of the boys have only shirt and one pair of pants, and the girls usually have just two frocks. The majority of them live with their parents and brothers and sisters in the single small room of a hut they have built themselves. The roofs are covered with plastic bags which hardly protect from the rain, especially during the three months of heavy rains caused by the monsoon. A good number of the children have only their mother living with them. The father has left home or else has died after an illness. The children who are orphans have been welcomed either by a nearby member of the family (uncle, grandmother ...) or else they live in the railway station, sleeping on the platform. As there is no public school in the area, some years ago we opened a little school near the station. Some children go to this school. Others cannot go: their parents need their help to increase the family income through collecting old papers, scrap iron, plastic bottles or boxes in the streets of the city or on various garbage dumps. 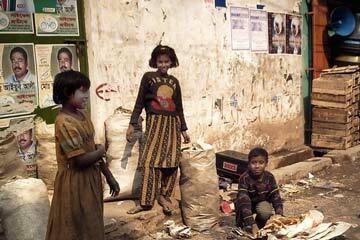 Their life might seem very hard, but at the same time, quite often, you hear some of these children singing. They have a great memory for songs, especially for love songs. Some learn by heart not only Bengali songs, but also Hindi songs from Indian movies, which are very popular here in Bangladesh. I’d like to introduce to you some of “our” children. I think that the most joyful of all is Shagor. He is 11 years old. He usually has a wonderful smile. He likes singing and in fact he sings very well. Yet his life has not been easy. He has had successively three fathers. His own father left when he was three years old. His present “father” married twice, abandoning his first wife to marry Shagor’s mother. The relationship in the couple is not good. The husband drinks a lot. The parents hardly talk to each other. But the father likes the children and is good to them. The mother tries to get a little income by selling cheap saris. The family is big: Shagor has five brothers and one sister. As food is quite expensive, everybody has to work. Shagor did not go to school at all (and all our efforts to get him into a school were in vain: he always refused to go), his brothers attended the school just for a few months. So the whole family is totally illiterate. 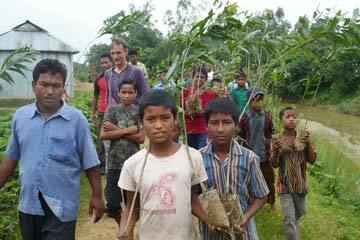 Shagor and his elder brother Tutul have been working for years. Shagor started his career when he was 7 years old. With Tutul they sometimes collect old papers in the streets of the city, or look for old pieces of iron, or help people to carry baskets in the fish market. Another little boy, Ridoy, is eight years old. He comes to our house almost every day, with his old rice bag on his back. He asks every time for the papers left in the baskets in our rooms or in the little store-room where he knows that we collect old papers. Ridoy lives in the slum near the railway station, in one of the dirtiest “plastic huts” there. He was always quite dirty when we got to know him. Ridoy has become much cleaner since he joined the club. Hira, who is 13, was brought up by his paternal grandmother. His mother abandoned her baby of one month old after quarrelling with his father. The father has been addicted for years to marihuana and gambling. Hira is illiterate. He went to school for only 6 months. Hira is one of the finest and most generous boys I know. Some of the girls live on the station platform. Their life is quite difficult. They can be quickly recognized for they usually wear very old clothes. Chormilla, 11, and her little sister Falani, 8, often come to visit us at the Taizé House when they are picking up old papers on the banks of the Brahmapoutra River where many people come to walk and have a little snack. Chormilla and Falani’s mother died four years ago. Their father is very much addicted to marihuana and so can only his children one meal a day. Chormilla’s brother, Kolli, 6, is an expert in stealing in the trains. He sometimes sniffs glue. When they come to the Club, Chormilla and her sister Falani like very much to dance. But we are worried about their future. 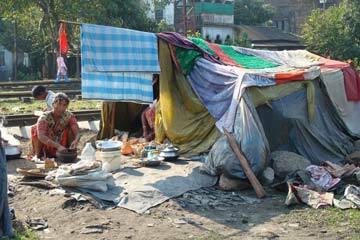 One of the girls living like them on the platform of the railway station recently ended up in prostitution.